My track record with atomic watches that receive a radio signal to synchronize and adjust the time is not good. I’ve tried about three different brands over the years and they just never seem to work well. My atomic clock in the bedroom does fine, mostly because it has an external antenna that I can position for optimal reception. Anyways, because I am a certified WIS and can’t resist a deal, I wanted to stubbornly try yet another brand of atomic watch and opted for this National Geographic watch, which in reality is made by Egana of Switzerland (a marketing company that contracts for manufacture of a number of ‘brands’ out there) but which carries a movement made by Junghans, a long-time maker of radio-controlled atomic movements and watches in Germany and the first company to market a radio-controlled atomic watch and clock. 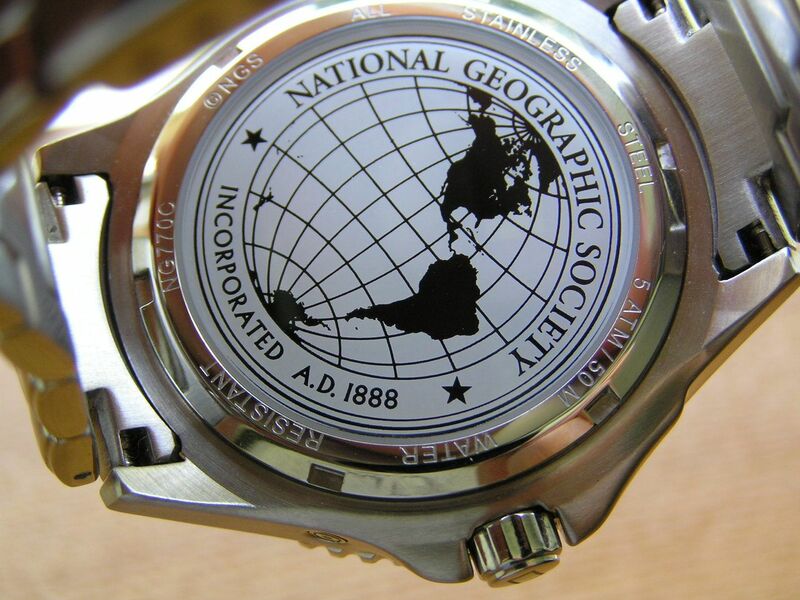 National Geographic (NatGeo for short) started selling watches carrying their name several years ago, the first time this well-known symbol of America proffered their name unto a product. Yep, another icon succumbs to the all mighty dollar. Anyways, by the looks of how many of these watches are on ebay and in the closeout shops online, nobody bought these things. Most of their watches as far as I can tell are pretty decent quality and the prices, at closeout, make them attractive buys. 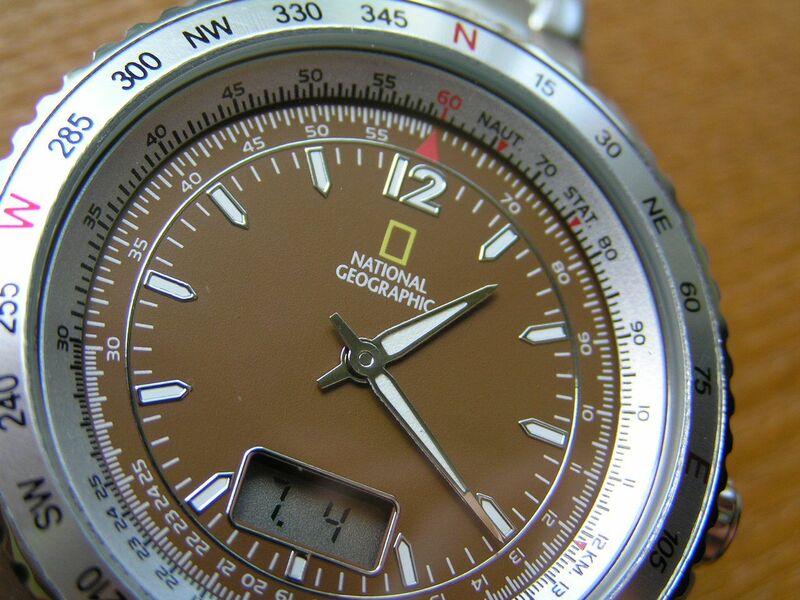 There is a dearth of accurate information on these NatGeo atomic watches online. Some info says the movement is German, other info says it is Japanese. Some say water resistance is 30 meters, some say 100 meters. No information was found on case composition or features such as a screw down case back, etc. But I took the plunge anyways and will offer the most accurate information/specifications I can muster since I now own one of these pieces. First off, the movement is a Junghans, but I did come across some information that said Junghans designed the movement then had Seiko tweak the design for size. So it is possible that it is a joint effort between the two companies. I have not cracked the back on this watch to see if the movement says ‘Germany’ or ‘Japan’, but it really doesn’t matter, it’s a quality movement as far as I am concerned. 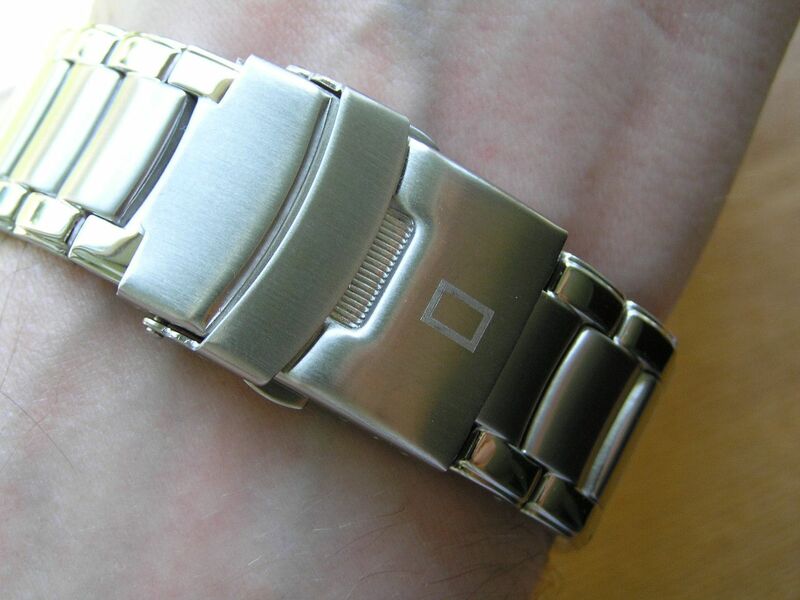 Another reason these watches may have sold poorly is because the instructions that came with the watch do not match the actual functions of the watch. The manual talks about features that do not exist (radio tower symbol, days since signal was last received, etc.) These seem to reference other calibers of Junghans movements but NOT the one that is actually in the watch. I could see a non-WIS being thoroughly confused and frustrated with this watch, since even I was perplexed initially until I figured out what was going on. I downloaded the correct instructions from the Junghans USA web site and they most closely match a movement that Junghans made under the Eurochron name. I’m still not sure if this watch receives only the Fort Collins WWVB signal or if it also is capable of receiving the European and Japanese signals as well. It seems that if the watch is set to the proper timezone where you are located, it then selects the proper receiver to use to synch the watch, but since I won’t be going out of the country anytime soon, I can’t be for certain if this is a multi-band watch. It could also automatically receive the signal when overseas and synch that way, I just don’t know, but to me, it’s not that important right now. Simplicity is really the name of the game with this movement, so much so that NatGeo designed the watch case sans any external pushers, which all the Junghans watches have. Instead of a standard pusher button, the case has two flush-mounted small pushbuttons that have to be depressed with a paper clip to activate. I guess they felt the need that no one would ever really have to use these buttons except for initial set up. Well, it was a good and bad decision. There is certainly no worry of accidentally pushing a button because they cannot be accidentally pushed. 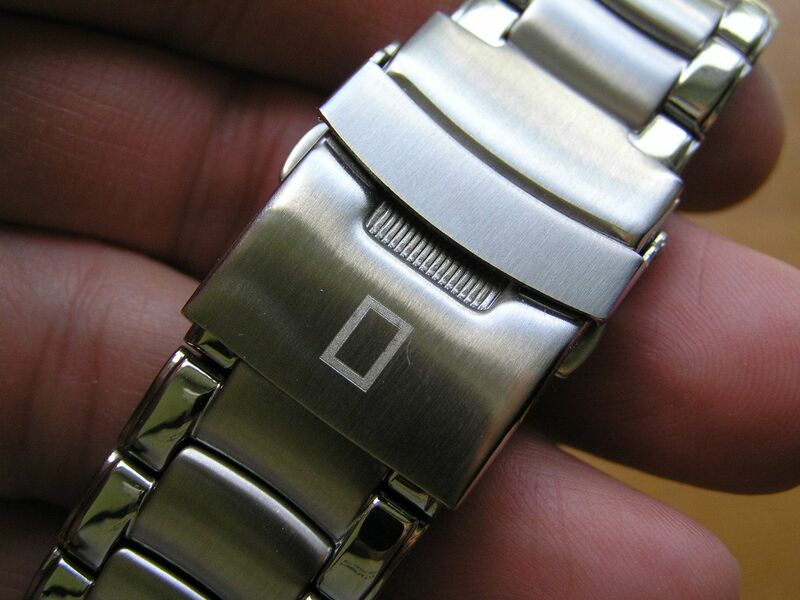 But the button located at the 2 o’clock position toggles between the month/date display and the seconds display (there is no analog clicking seconds hand on this watch), so if you want to display one or the other, out comes the paper clip. Not too user friendly. 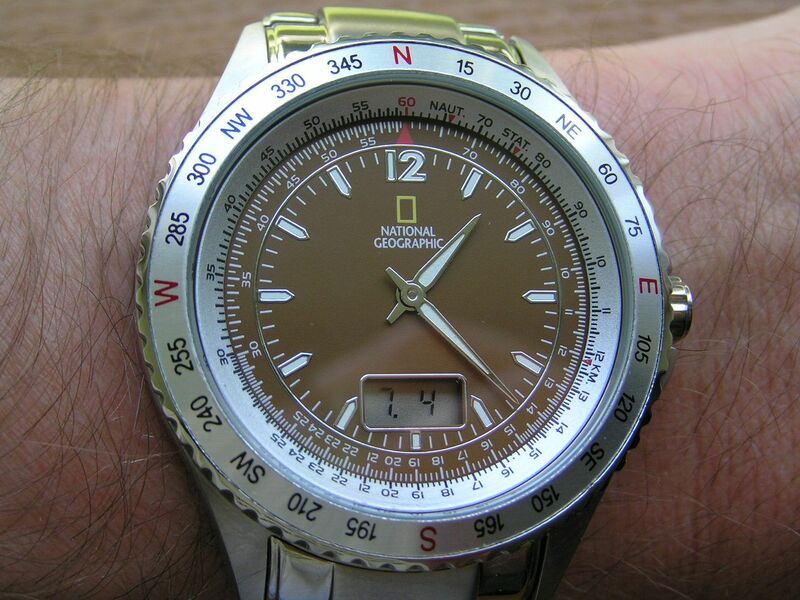 Once the proper timezone is selected (using the pushbutton at the 9:30 position on the left side of the case), the watch will synch itself overnight and that’s all there is to it. But there is no indication (other than accurate time keeping) that the watch has successfully received the radio signal and synched the time. I have had this watch for almost two weeks and it is spot-on with my atomic clock, so I can only assume that it is receiving the signal and synching. The other possibility is that the quartz movement is highly accurate and is keeping perfect time in absence of the synch signal, but I really doubt this. The ability to receive the signal and synch properly was my biggest concern, and so far, this watch seems to have passed this test. The case is all brushed stainless steel with a stainless steel screw down signed case back that has a rather cool looking NatGeo world logo on it. The crown is signed and all it does is rotate the inner slide rule bezel that measures fuel consumption, square root, estimated flying time, airspeed, currency conversion (! ), etc. It’s like something James Bond would use and much too complex for me. 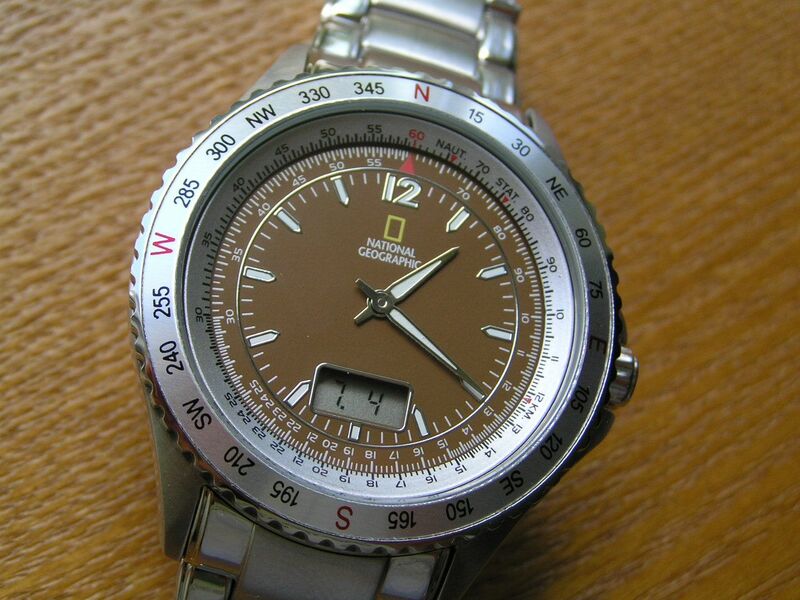 The rotating bezel on the outside is a unidirectional 60-click compass style. 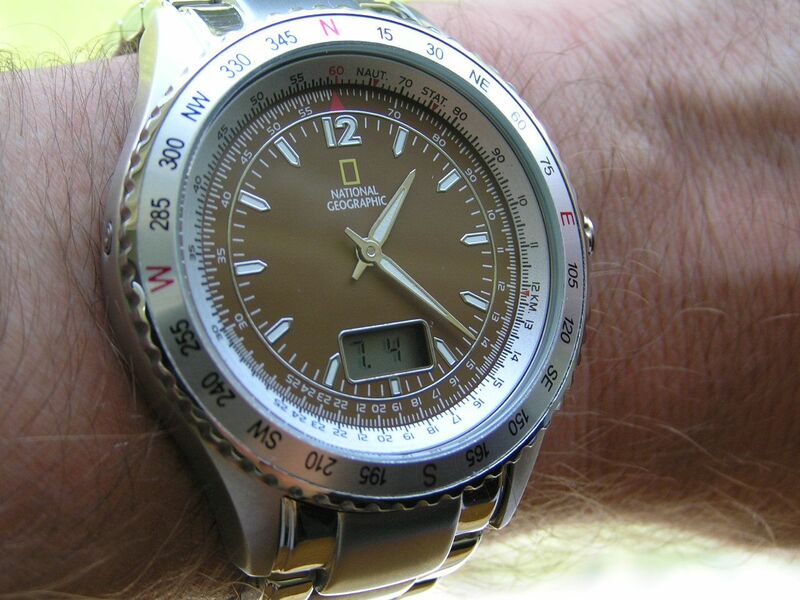 I would much have preferred a standard rotating timing bezel. The case measures 42.8mm without the crown, 46.4mm with the crown. The crown is protected by guards which protrude out from the case sides. Case thickness is 11.8mm, lug width is 22mm. The crystal is flat mineral. 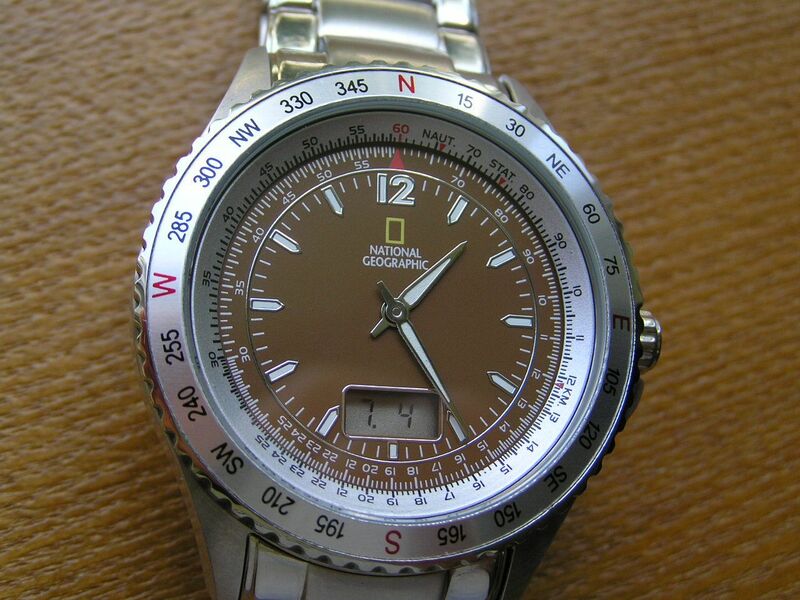 The watch is factory rated for 50 meters water resistance. I love the shade of the warm brown dial, which is one reason I bought this watch. I wanted a brown dial in the collection again and not a root beer, metallic brown or some other shade that really isn’t a true brown. I wanted brown and that’s what I got with this piece. The hands are luminous as are the applied markers and the ‘12’ at the top of the dial. 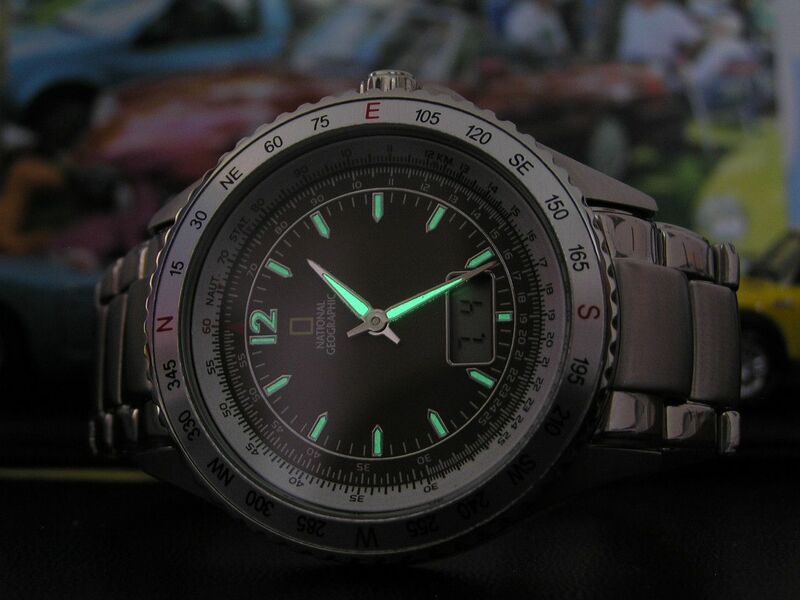 Lume quality is pretty good. The lower digital window displays the month/date or seconds and is also used to display and set the proper timezone. The display will also read ‘LO’ when the battery voltage drops below 2.4 volts, which is a nice touch. The battery is a CR 1620 lithium with a rated life of two years. 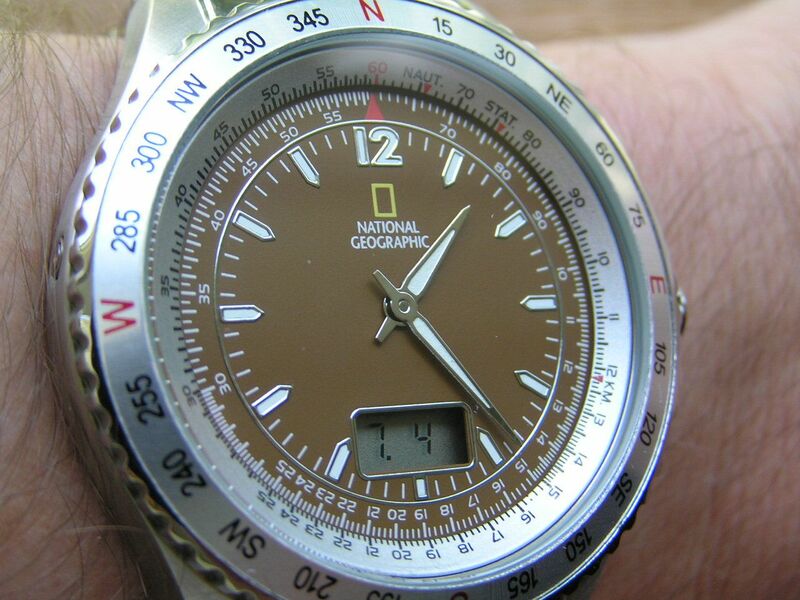 The alignment of the hands with the markers on the dial could be better, as this watch only moves the minute hand once every minute, not every 20 seconds or so like some computer-controlled analog watches do, so to me, accurate alignment of the minute hand to the markers is essential. The hands are also a bit thin, but are fairly ‘dauphine’ shaped and are pleasing to look at. 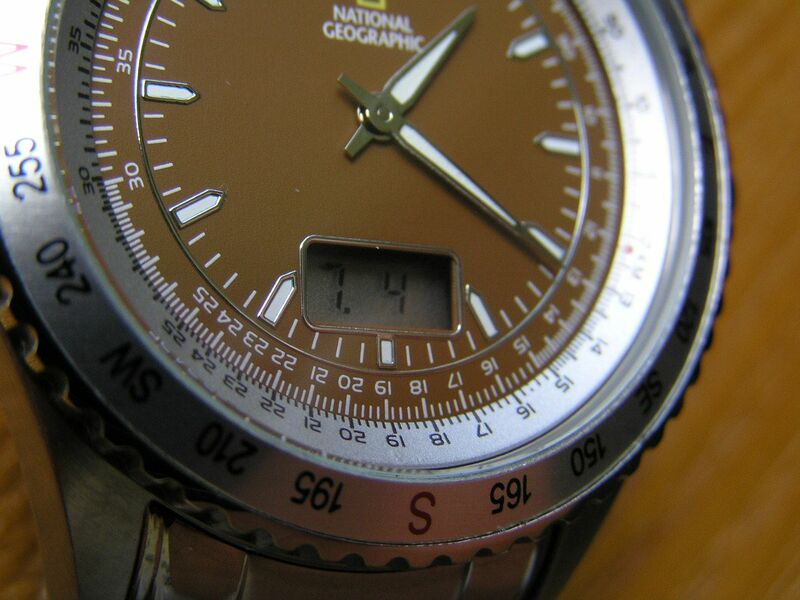 Overall, the dial is clean and uncluttered, save for the chapter ring with all the calculations it can perform. The bracelet is solid link stainless steel with brushed center sections and polished outer edges on the links. The bracelet also has solid end links. While the signed clasp has a cheap stamped steel deployant, it is a pushbutton, double locking design, so it gets a pass from me. 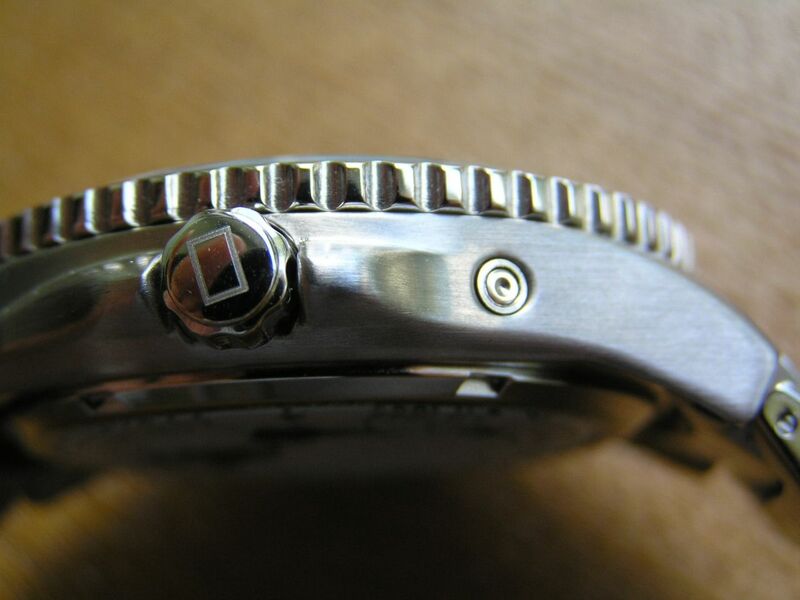 The bracelet measures 22mm at the lugs and tapers to about 20mm at the clasp. 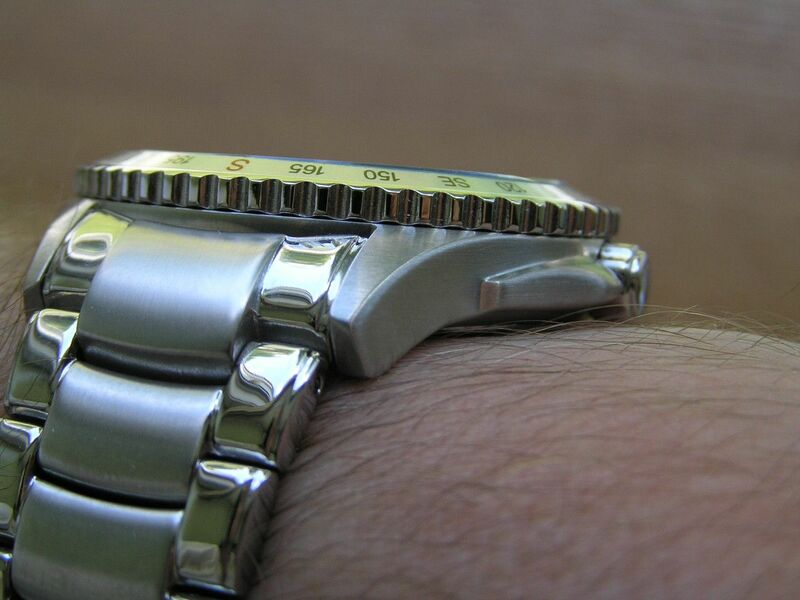 So at least this watch has most of the requisite feature set I look for in a watch: solid link bracelet, solid end links, all stainless steel construction, screw down case back and double locking clasp. 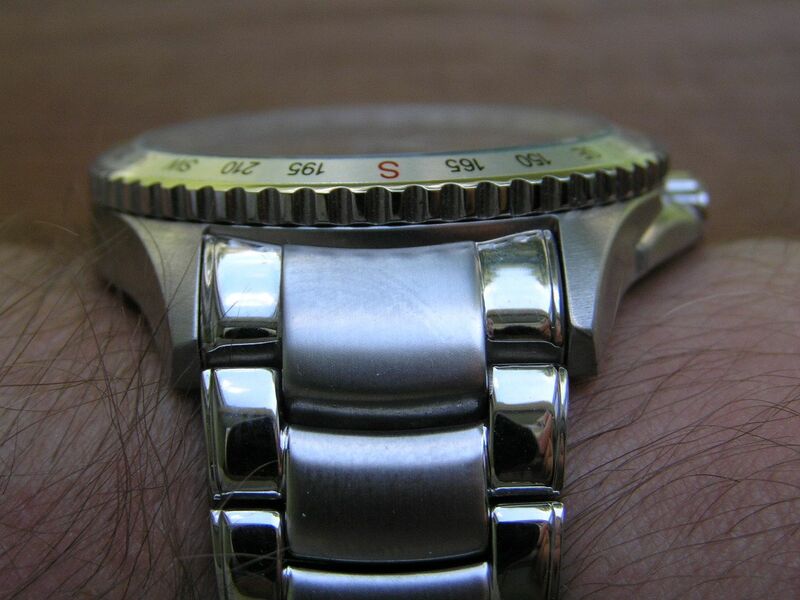 The movement seems like it is receiving the radio signal properly and the overall look of the watch is pleasing. I sold this watch shortly after I purchased it. While the synchronization with the atomic clock was perfect, I couldn’t get past the lack of an analog second hand and the slide rule bezel wasn’t to my liking.